For the second installment (before the full reveal!) 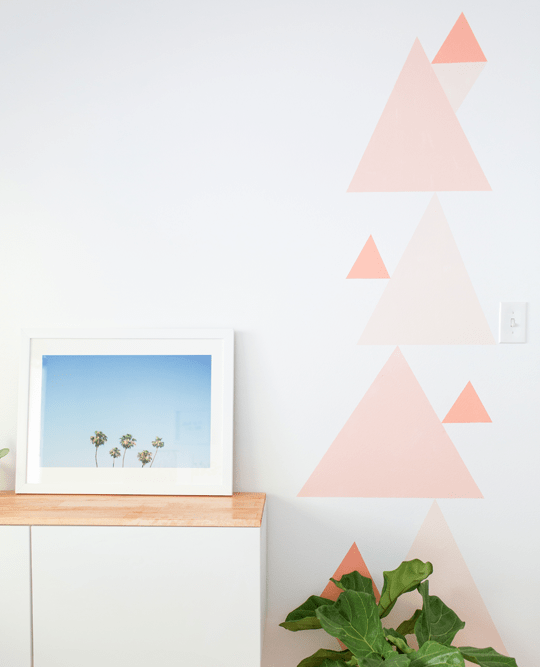 of Ainsley’s room makeover with Valspar, I present to you my take on the ever-faithful DIY geometric accent wall. You already all know that I love a good white, bright room, but for a little girl I wanted to punch it up a bit with a colorful, modern touch in her favorite colors. 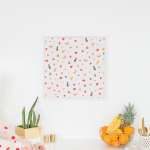 This project is perfect for a quick weekend update because you don’t need to go full-force on a whole room, it’s more like a quick, table-runner version of an accent wall by just highlighting a small section and leaving the rest of the color up-to the pretty accessories. 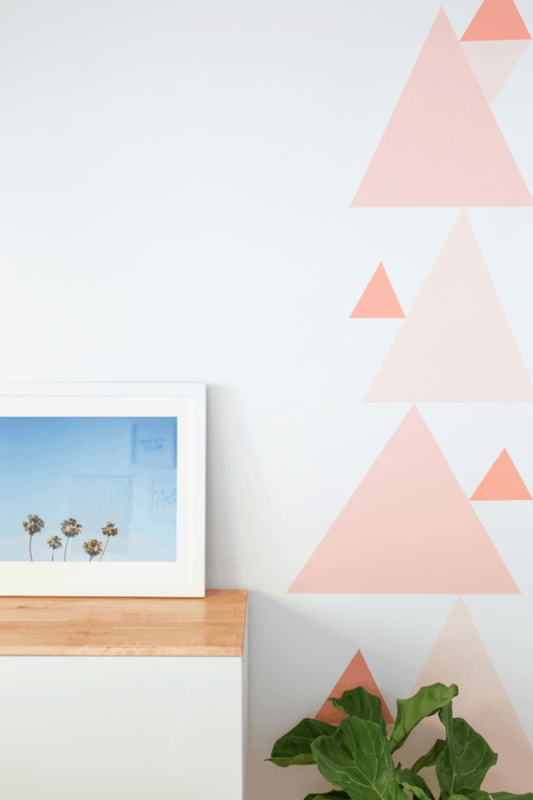 Starting at the bottom of the wall, use the painter’s tape to tape off a large triangle, using the level to make sure the bottom tape line is straight. 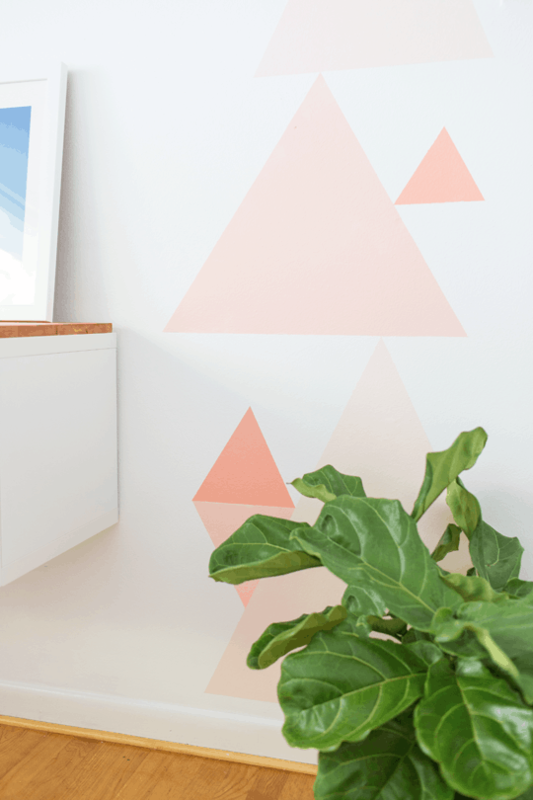 Painting the bottom triangle first will allow you to build up the wall from there, being able to visualize the end product better, especially with all of the Valspar Reserve color options in case you’re choosing your own color combinations to mix and match. 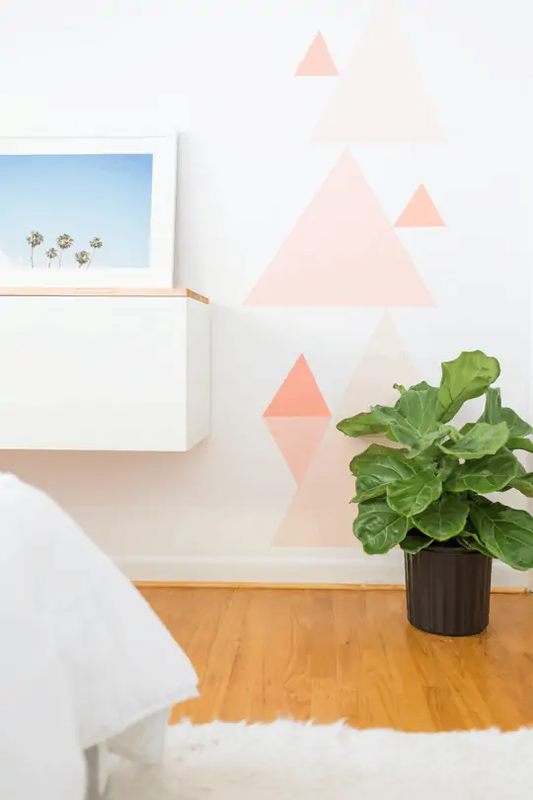 By using multiple Valspar Reserve colors from the same color family you’re not only keeping the accent wall toned down by not being too contrasting, but you also get to skip the trouble of having to pick just one favorite. Plus it’s stain and scrub resistant which makes it a great choice for redoing spaces with littles ones that might get a little over-zealous with crayons here and there. 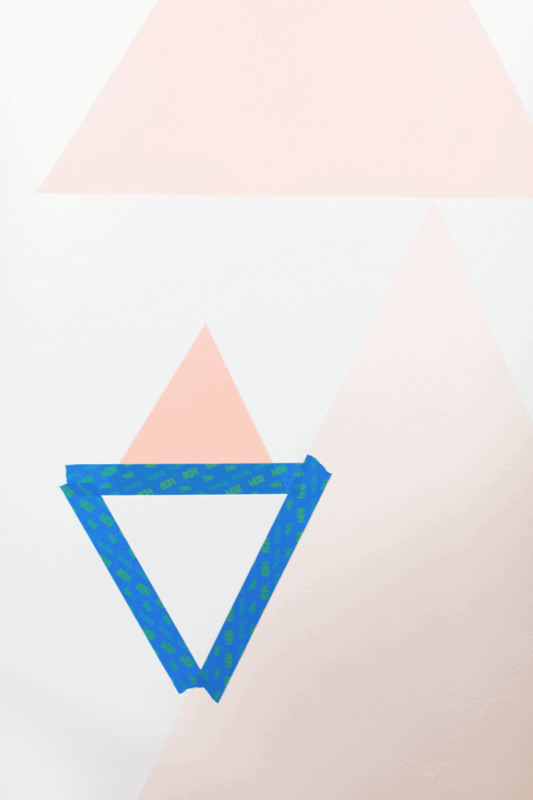 Paint your first color choice in the triangle, and then remove the taped edging. 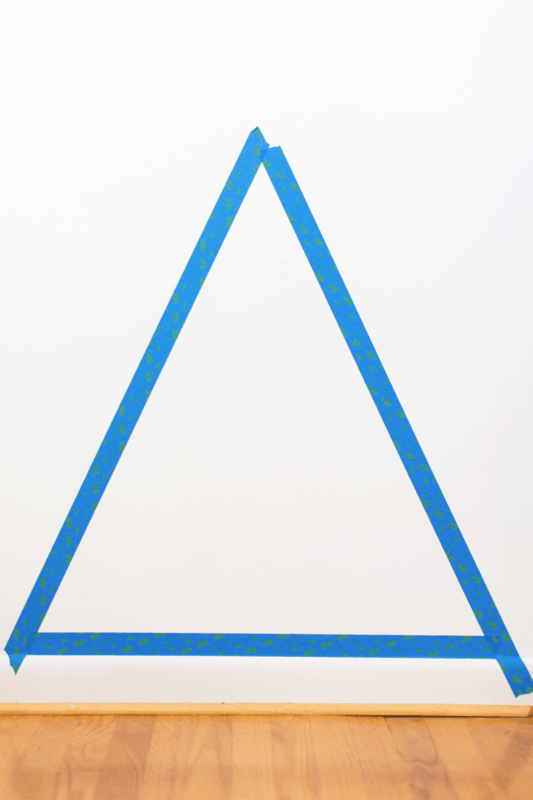 Let it dry to the touch, and then use the top of the first triangle as the base point to your next, somewhat smaller, taped triangle making it slightly off-centered from the first so that they stagger up the wall as you go. Repeat the painting process for all of the larger squares letting them dry and then using them to move on to the next triangle making sure they all touch. 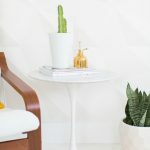 Once the larger ones are all painted and fully dried, use the painter’s tape and level to make a small triangle on either side of select triangles (not too many so that they are just small points of interest), and then paint them the colors of your choice. 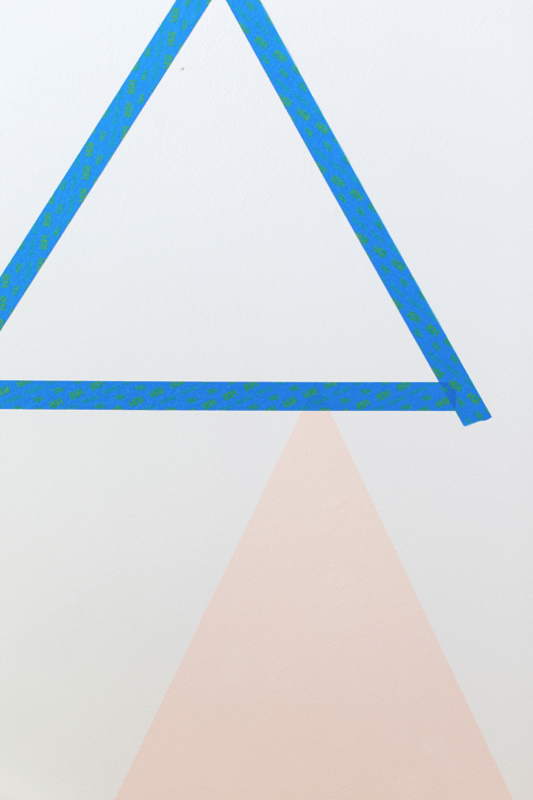 Once those are dried, tape off a triangle that’s mirrored upside down on the small triangles to make color blocked diamond shapes, then paint. 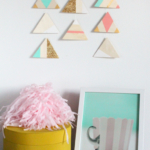 Once they’re all dried, you’re ready to style and enjoy your quick and easy new geometric accent wall! I also really love the idea of doing an ombre version of this project. I toyed with doing so for Ainsley’s room, but I wanted to use the colors evenly to create a full wall as opposed to your eyes being directed toward just one section first. I really love the way it turned out, and it’s just the perfect amount of girly for her, while still being neutral for when they use the room for guests! 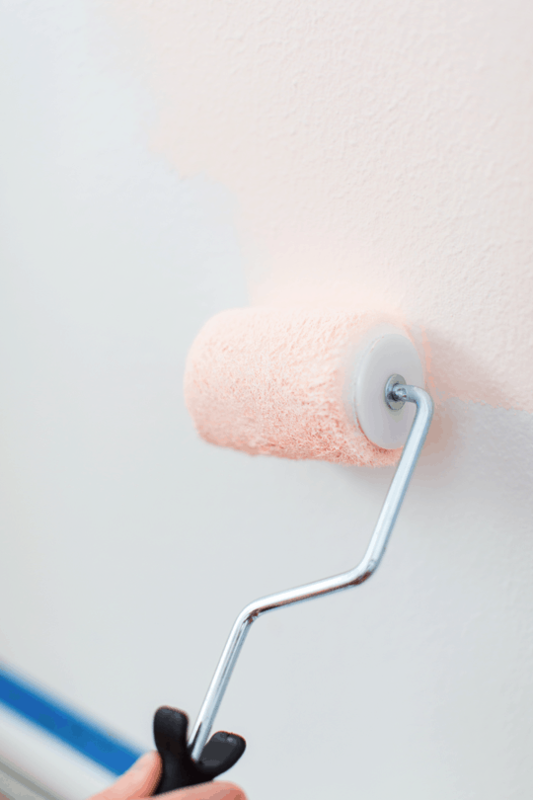 What’s your favorite weekend paint project that you’ve conquered? I’ll be honest, I’m always a sucker for quick satisfaction when it comes to room makeovers! 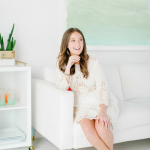 This makeover series is made possible in partnership with Valspar. 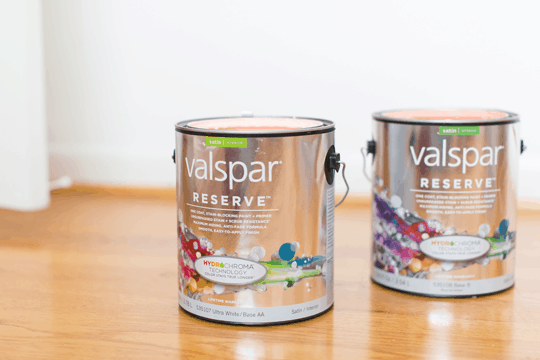 Find Valspar Reserve, exclusively at Lowe’s. Thank you for supporting the brands that allow us to bring bigger and better content to you! Love this! It looks so great and think this is a paint project I could actually do. If I had any walls I was allowed to paint I’d be doing this.